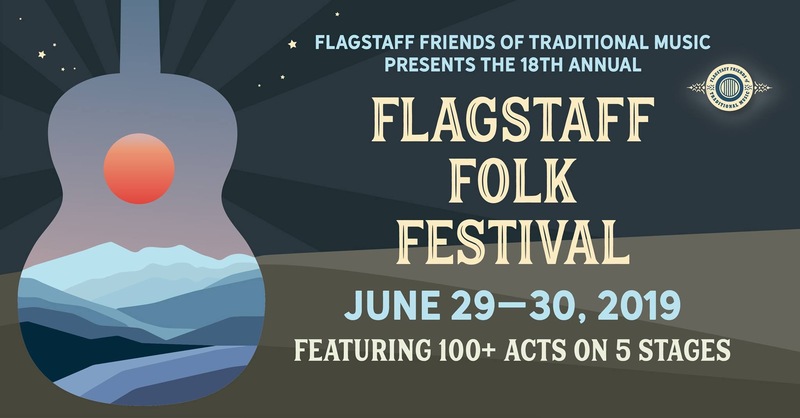 2019 is the eighteenth year the Flagstaff Folk Festival proudly showcases the best in folk and acoustic music in Arizona and beyond. We feature over 150 acts on five stages, workshops, jams, and more. We invite you to come out and see some great live music in a wonderful setting. The festival will be held Saturday and Sunday, from 10 AM to 6 PM both days. Admission for the festival is $5/person & $15/family per day. To get to the festival, take Humphreys St North from Downtown Flagstaff, following directions to the Grand Canyon. At the 3rd light, turn left on Fort Valley Road. After about 3/4 of a mile, Sechrist Elementary School will be on your right. You can park in that parking lot. Just past the school, turn right into the Coconino Center for the Arts & Arizona Historical Society Pioneer Museum. The address for the Center is 2300 N. Fort Valley Rd. Parking is free. The festival features five performance stages running both Saturday and Sunday from 10 AM to 6 PM. Stages are either indoors or outside with covering. There is also a workshop area which will feature a number of workshops open to anyone. Besides scheduled performances there is always informal jamming taking place throughout the grounds – so if you are a musician and are not performing, feel free to bring an instrument or two along and join in a jam or workshop. Friendly dogs on a leash are allowed outside, but it is strongly discouraged to leave your dogs in your car because it will get HOT in the sun. No smoking is allowed on the festival grounds because there are pine needles everywhere. Smoking is only allowed in your vehicle. We have a number of food vendors and plenty of place to stretch out on our grounds. Festival admission includes access to both the Coconino Center for the Arts exhibits and The Arizona Historical Society Pioneer Museum. A few folks have asked about camping options for the Folk Festival so we decided to add this page to answer some of your questions. The festival grounds are small and tight, so no RVs are allowed to park onsite during the festival. The festival is produced by The Flagstaff Friends of Traditional Music in partnership with the Flagstaff Arts Council and the Arizona Historical Society Pioneer Museum. The festival coordinators are Rebecca Cooke and Larry Peterson. For more information, please email flagfolkfest@ffotm.net or call (928) 607-8480.